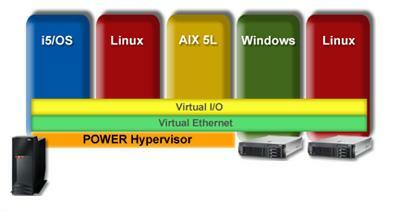 When Hardware resources of many computer’s are Virtualized as a separate computer, this whole process is called Logical Partition or LPAR. A single physical machine can be portioned into multiple LPAR’s with each accommodating a separate operating system. Mostly Logical portioning is performed on the hardware layer. Two LPARs can access memory from a common chip with ranges of addresses which are directly accessible do not overlap each other. There is a provision of one partition controlling memory of the second partition indirectly, only by commanding a process of the second partition to directly operate on the memory. CPU can be shared between two LPAR’s or can be dedicated to one. LPAR technology was first developed by IBM mainframe for the mainframe architecture ESA/390. IT continued for System Z architecture and later IBM extended usage to non-mainframe like pSeries. LPAR’s are managed by PR/SM facility on IBM mainframes. Some of the modern IBM mainframes operate exclusively in LPAR mode, even if there is only single logical partition on a machine. It is safe to do development, quality assurance and multiple quality tests. There are many advantages associated with LPAR’s like faster deployment, low costs and easy to use. IBM mainframe LPARs are Common Criteria certifiable, that means that they act as physically separate servers with no connections. This property makes them most suitable for the use of highest security organizations like military. This entry was posted in Colocation Services India and tagged Colocation Servers, Colocation Services, Logical Partition, LPAR. Bookmark the permalink.